The AstroSat, the multi-wavelength space based observatory of India, launched on September 28, 2015, has completed more than 100 days in orbit and has experiments covering the UV and X-ray wavebands to conduct observations in the area of astronomy. The Performance Verification (PV) phase of AstroSat is now half way through and it was decided to review the operations so far in order to assess the gain in understanding of the spacecraft operations and the scientific outcome envisaged. Based on this review it is certain that ISRO and the Science community stands vindicated that the outcomes are as expected and in a short while the learning from this mission is enormous. The AstroSat, with all its Five payloads of astronomy, is unique and the operational procedures enhanced to suit the payload requirements unlike the earlier remote sensing or communication missions of ISRO. The astronomy payloads demand stringent geometrical constraints with respect to bright objects in space, specific state of payloads during South Atlantic Anomaly (SAA), Earth Occult and eclipse (night side) regions and finally constrained attitude manoeuvres avoiding Sun in +Roll and +yaw axes of the spacecraft simultaneously. This requires utmost careful planning on ground and executing the same on orbit. The AstroSat pointing accuracy is found to be dependent upon two factors; the settling of gyro drift behaviour and lack of updates of the star sensor during the earth albedo region. Both sensors are studied on-orbit for a whole month and procedures built to counter their effects. Gyro base temperature affects gyro drift and therefore a tight control on base temperature was exacted by controlling Sun-pitch and Earth-pitch angles. This solved the gyro drift problem. Similarly the star sensor, and updates of gyro are supplemented by extensive modelling on ground. Subsequently, the procedure is incorporated into the payload programming software and automated for current operations. UVIT is the ultraviolet-visible eye of AstroSat. 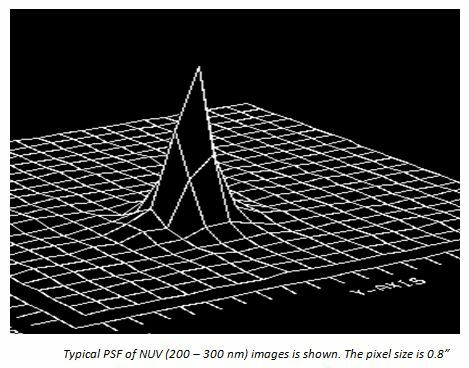 It is designed to make images over a field of ~ 28’, simultaneously in 3- bands: FUV (130-180 nm), NUV (200-300 nm), and VIS (320-550 nm). 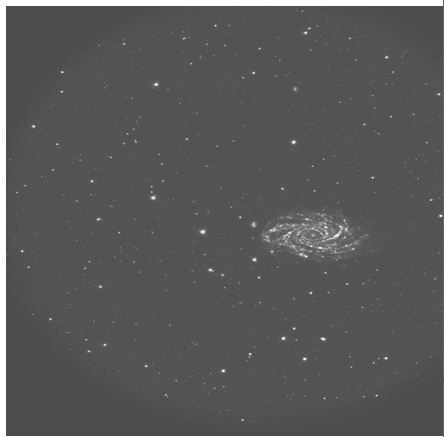 The specified spatial resolution for the ultraviolet is < 1.8” Full Width at Half Maximum (FWHM). UVIT started observing the sky on 62nd day after the launch. 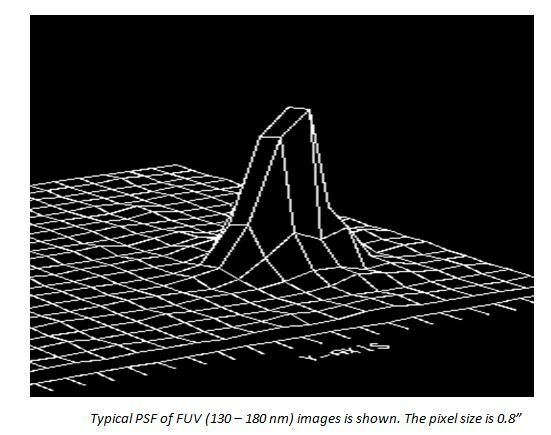 Preliminary analysis of the initial observations indicate that the payload meets the requirements of sensitivity in FUV (130-180 nm) of maximum effective area as ~12 sq cm and spatial resolution of <1.8” FWHM in ultraviolet. Some of the preliminary results are presented in the following figures. 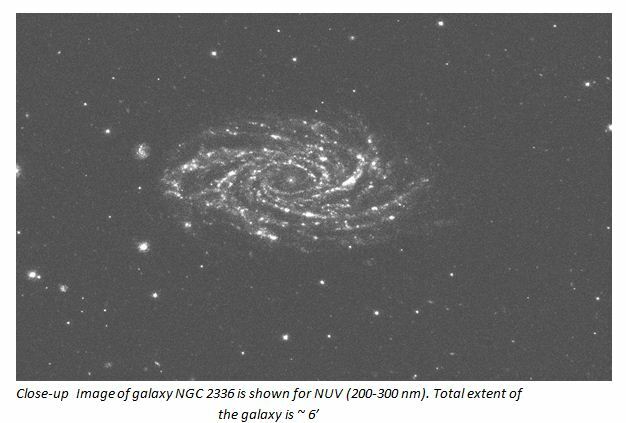 The Soft X-ray imaging Telescope (SXT) on board AstroSat is a grazing incidence doubly reflecting Telescope with a cooled CCD at its focus to observe cosmic X-ray sources in 0.3-8.0 keV energy band with spectral resolution of 2.5% @ 6 keV and a spatial resolution of ~ 2 arc-mins (FWHM). The initial operations of venting of the camera body, switching ON the electronics and the temperature control and stability were achieved in October 2015. The instrument was assessed first with the onboard calibration sources. The camera door was opened to the sky on October 26 , 2015 with first light image of the blazar PKS 2155-304. The first figure is that of Tycho Supernova remnant (also called SN 1572 or 3C 10) one of the bright supernovae visible to naked eye as found in historical records. This remnant is located in the constellation Cassiopeia. An X-ray spectrum provides both the continuum spectrum which is indicative of the temperature of the plasma and the lines of the elements which are expected to be formed during the final evolution before the supernova explosion. The X-ray spectrum provides observational proof of these elements. X-ray Spectrum of Tycho supernova remnant using SXT; emission lines from ionized Mg, Si, S, Ar, Ca in the millions of degrees hot plasma can be seen clearly, the most prominent line being that of ionized Silicon. 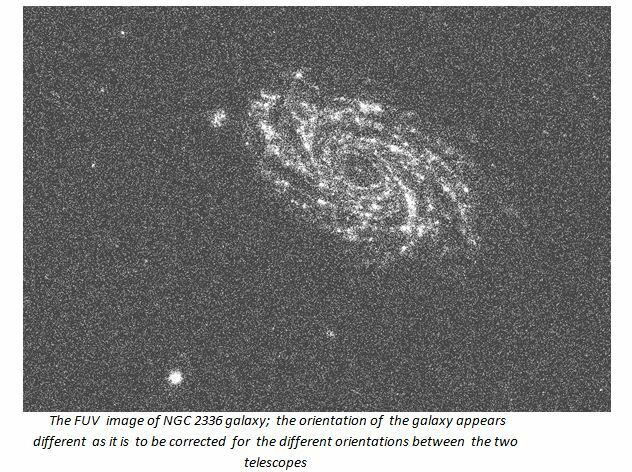 Near-simultaneous observation with Swift carried out and data analyzed jointly. See the spectra obtained with SXT (Oct 26, 18:20:10 (3500 s)), and Swift (Oct. 25, 20:40:40 (1470 s)). Swift data are shown in red color. 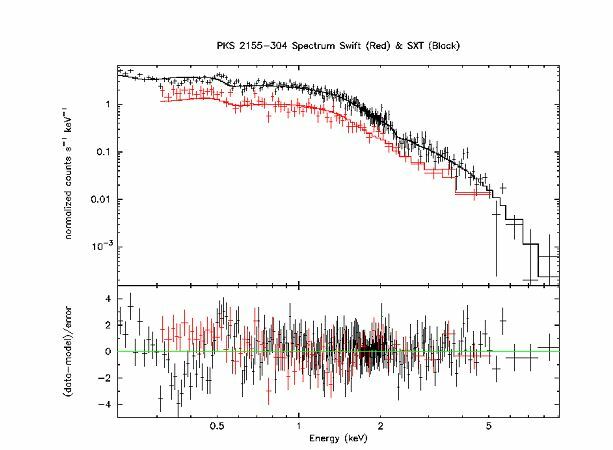 There is an agreement to within 20%, some of this discrepancy could be due to intensity variations in the source as observations are ~21 hours apart. The SXT bandwidth can be seen to be wider than that of Swift. There are three large Area X-ray Proportional counters (LAXPCs) covering the energy range of 3-80keV. These are currently the largest area proportional counters operating in space. These counters were switched ON in October 2015, with the high voltages turned ON gradually. The gas in the counters were purified using an onboard purifier. 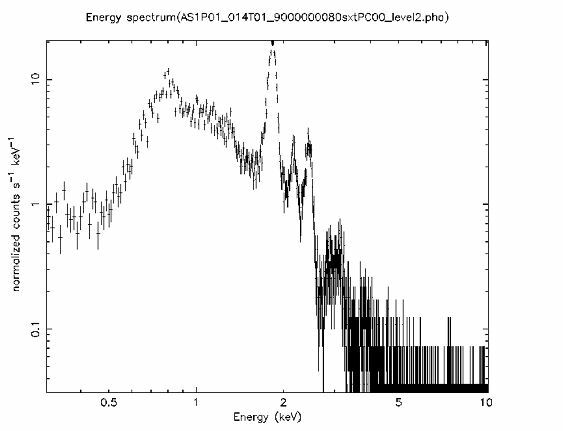 The following figure gives the continuum spectrum of GRS 1915+105, an X-ray binary with a black hole. This source also emits jets and is termed as a micro-quasar. The continuum spectrum changes as the source goes through different spectral states. 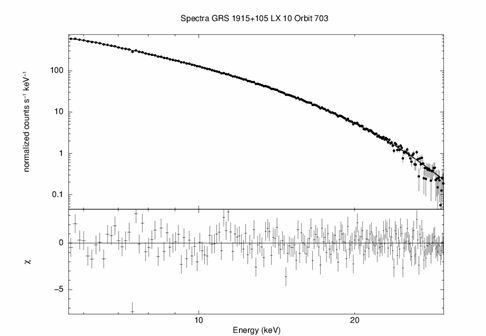 Continuum spectrum of GRS 1915+105 obtained with one of the LAXPC unit. The top panel shows the observed pints with a fit line. Bottom panel shows the residuals of observed points with respect to the fit. The residual figure is checked for goodness of fit. The aim the Scanning Sky Monitor is to scan the sky in order to detect and locate X-ray transients in the energy range of 2-10 keV. This payload is now observing portions of half of the sky on the other side of sun for X-ray transients. The performance verification and pipeline to put the data on web is under progress. 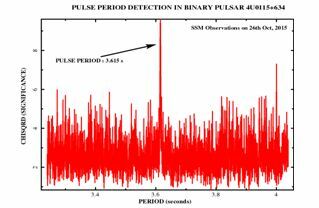 Stares were performed on 4U0115+63 which is a neutron star binary pulsar on October 26, 2015. During these stares the payload can be operated with a fine time resolution. Following figure shows the detection of the 3.6s rotation period of the neutron star using this payload. 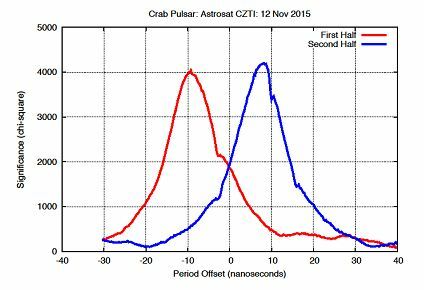 The fit significance as a function of trial period for the Crab pulsar observed by the CZTI during 12 November 2015. The abscissa shows the difference of the trial period from the average period during the 24-hour observation. The first half of the data clearly shows a period shorter than that in the second half of the data. The difference of 18 nanoseconds matches exactly the known rate of spin-down of the Crab Pulsar. The individual requirements of each payload are now fine-tuned and automated operational procedure is being established. AstroSat team is now ready to meet the future challenges of the astronomy mission to explore the deep space with these world-class instruments.